This summer, Ben Keating began work as a Graduate Student Research Assistant, joining GSRAs Lizzie Hutton and Sarah Swofford in their ongoing involvement with Sweetland’s various research projects. Ben Keating’s summer began with a course on survey data analysis and statistics at U-M’s Institute for Survey Research, which he took in order to assist in data analysis for Sweetland’s longitudinal Writing Development Study. A second year in the Joint Program in English and Education, Ben’s interests include literacy theory, discourse analysis, and issues of equity and access in college writing courses. He is currently working on a project that brings these interests to bear on high school-to-college bridge programs. 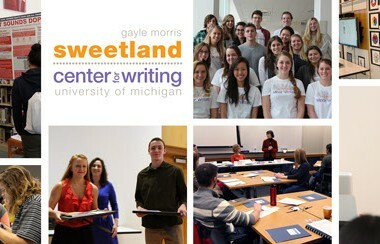 Lizzie Hutton, in her second year as a GSRA and third year in the Joint Program in English and Education, continues to contribute to Sweetland’s investigation into undergraduate writing development, especially as pertains to the use of portfolios and reflective writing, and Sweetland’s work on the effect of writing on both confidence and skills in the undergraduate science classroom. In her own research for her doctoral program, Lizzie is focusing on the role of reading in effective writing. Sarah Swofford, a third year GSRA, has spent this fall collecting data for her dissertation, which focuses on the effects of language ideology on rural southern students, especially in their transition from high school to first-year writing. As a GSRA, she assists in survey design and data collection for Sweetland’s many studies, including Michigan’s ongoing program of Directed Self Placement. 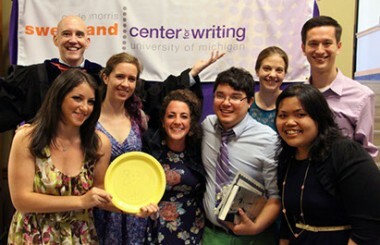 Starting in August, the Sweetland GSRAs were also happy to have their work assisted by Laura Aull (PhD 2011), once herself a Sweetland GSRA and now an Assistant Professor of English at Wake Forest University. Laura was in Ann Arbor for the fall conducting research for her upcoming book on corpus linguistic and rhetorical analysis of Directed Self-Placement essays, during which time she also helped update U-M’s own Directed Self-Placement process.